“Ha ha ha,” politely hoots the chimpanzee, not exactly rolling on the floor. He’s not laughing spontaneously or for very long, but he does want to encourage his playmate to keep up the antics. Continuing on in the spirit of last week’s post on the rodenty laughter of tickled rats, today’s post features a recent study on social laughing in chimpanzees. As we all know quite well from experience, human laughter is a many-faceted thing. Sure, we sometimes laugh spontaneously and joyously (this is known as Duchenne laughter), but we also use our laughter as a multipurpose social tool, enabling us to establish rapport with social partners, to announce that we are nonthreatening and open to further communication, to alleviate tension and break barriers when meeting an unfamiliar face, and even to exclude others by demonstrating scorn or derision. In short, laughter sends a wide range of communicative signals, and our mastery over its many varieties lies close to the core of what’s sometimes referred to as emotional intelligence – the sophisticated way in which we assess, understand and navigate social situations. Marina Davila-Ross and her co-researchers from the University of Portsmouth decided to test some chimpanzees to find out. They studied 59 male and female chimpanzees of all ages living in four separate colonies at the Chimfunshi sanctuary in Zambia – two smaller colonies that had formed within the past five years, and two larger ones that had been together at least 14 years. In general, the chimps in the colonies that had been together longer belonged to more established families and had grown up with more opportunities to play with others in a familiar social environment. First, the researchers videotaped almost 500 one-on-one play sessions, documenting what the chimps did and when they laughed. The researchers recorded spontaneous laughter as well as laugh replications (laughter that followed within five seconds after a playmate’s laughter), and further noted whether the laugh replications occurred during the first second (rapid laugh replication) or within the next four seconds (delayed laugh replication). Chimps in the more recently-formed colonies replicated the laughter of their playmates more frequently than did the chimps in longer-established colonies, even though the aggregate amount of all laughter in each of the colonies was relatively comparable. Infants generally engaged only in spontaneous laughter, with little or no laugh replication. Play bouts lasted significantly longer when they were accompanied by laugh replications than when they weren’t. Laugh replications peaked at two discrete points, first at about .7 to .8 seconds after the initial laugh, and then again between 2 and 3 seconds after the initial laugh. Next, the researchers tried to verify whether laugh replications were specifically triggered by a playmate’s laughter, and not just coincidentally associated with it. They combed through their previously-recorded video footage and, for specific chimps and their playmates, found matching play scenes that generally lined up very closely in terms of specific behaviors (chasing, tickling, grabbing, wrestling, gnawing, hitting, jumping, game playing, etc. ), but that differed in one important respect – in one scene, the chimp’s playmate engaged in a potentially-triggering bout of laughter; in the other scene, it did not. 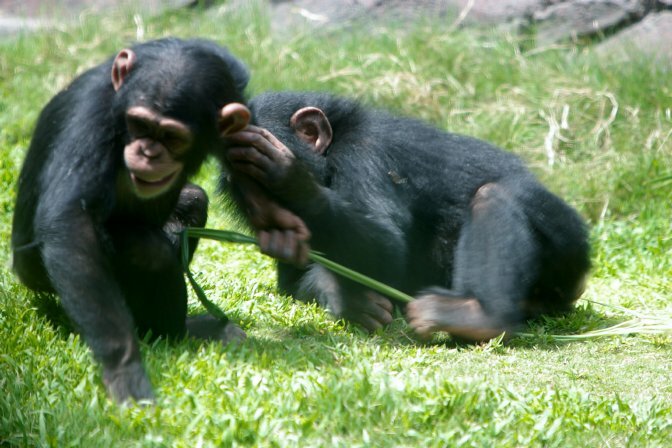 When the researchers reviewed these paired scenes, they found that a chimp was significantly more likely to laugh in those scenes in which the other chimp laughed first, suggesting strongly that replicated laughter really was triggered by the playmate’s laughter as opposed to any other aspect of the chimps’ play behavior. 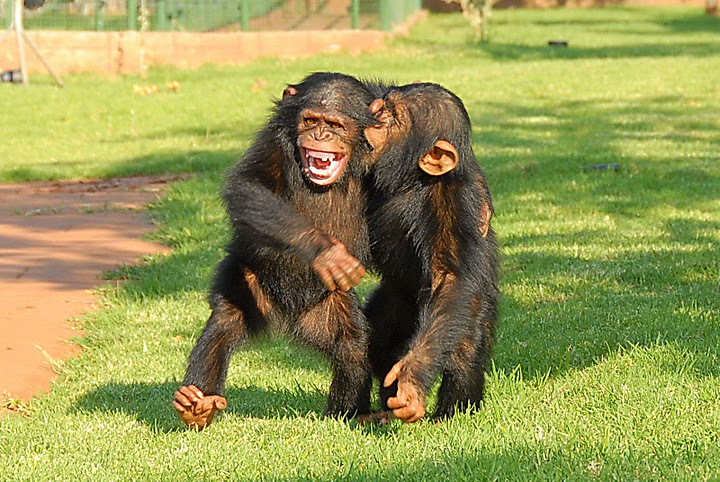 Based on their findings, the researchers concluded that chimps laugh in response to the laughter of their playmates, that this laughter differs in acoustic form and timing from their spontaneous laughter, and that the purpose of their non-spontaneous laughter appears to be to prolong social play, promoting group cohesion and perhaps providing the chimps with important social advantages. In support of these conclusions, the researchers also observed that the lack of laughter replication in infant chimps suggests that socially managed laughter is a skill that chimps learn as they mature. Further, they hypothesized that the chimps in the newer colonies may have engaged in more replicated social laughter because they were living in a less predictable social environment and may have had a greater need to manage laughter in order to establish social cohesion. So, next time you’re at a party with a group of laughing chimpanzees (don’t think I don’t know you, AnimalWise readers), listen very closely to the rising levels of laughter around you. While you might be tempted to believe that you’re hanging out with a particularly hilarious crowd, the truth may be that your fellow party goers are simply adept at using laughter as a social lubricant. Let the good times roll! Davila-Ross, M., Allcock, B., Thomas, C., & Bard, K. (2011). Aping expressions? Chimpanzees produce distinct laugh types when responding to laughter of others. Emotion, 11 (5), 1013-1020 DOI: 10.1037/a0022594. You’re right, that’s a really good point – the play bow in dogs does seem to play a very similar role to that of social laughter in chimps. Also, I enjoyed your post (and note for the record that Argo is totally cute: it’s impossible to imagine anyone resisting his invitations to play). And, for those who haven’t checked out Jason’s Thoughtful Animal blog at Sciam, please consider this my play bow – click on the link and you won’t be disappointed!